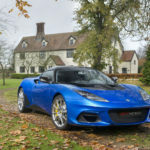 Adding to the acclaimed Evora 400 and Evora Sport 410 models, the new Evora GT430 range now includes two body options and a choice of manual or automatic transmission. Joining the recently announced Evora GT430 is the Evora GT430 Sport, a new member of the family that carries the same phenomenal firepower and sculptured body-style but without the additional downforce-creating aerodynamic elements. Both models are powered by the same 3.5-litre V6 supercharged and charge cooled engine, producing 430 hp and 440 Nm of torque (Automatic version: 450 Nm). 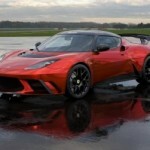 Without the aerodynamic elements, the Evora GT430 Sport weighs 10kg less at 1248 kg (dry), bringing the power-to-weight ratio to 345 hp / tonne and the top speed to 196 mph (315 km/h) making it the fastest Lotus production car ever. 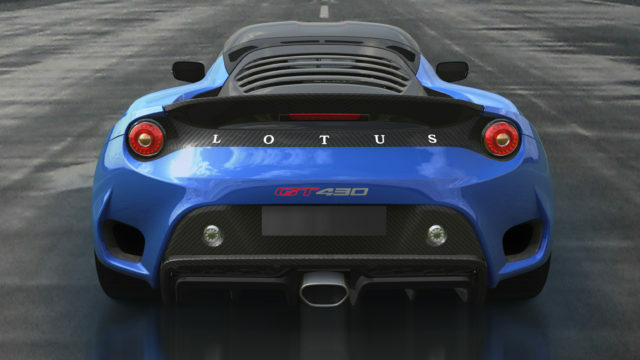 The Evora GT430 is differentiated from the Evora GT430 Sport through the inclusion of motorsport derived aerodynamics provided by a carbon fibre splitter, a large, profiled carbon wing and louvers on top of each front wheel arch which reduce pressure within the front wheel arches together with wider wheels and tyres. Automatic transmission will be available from January 2018 for both the Evora GT430 body configurations. With 10 Nm more torque (450 Nm), the Automatic version is even quicker, with a 0-60 mph time of 3.6 seconds. The six-speed automatic transmission utilises an optimised gearbox ECU for ultra-fast changes, whilst gear selection is made via lightweight aluminium paddles mounted to the steering wheel. 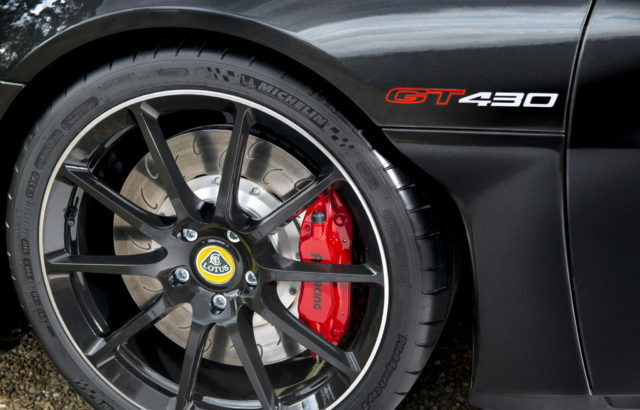 Boasting a high specification, the new Evora GT430 range includes, as standard, Öhlins TTX two-way adjustable dampers, J-grooved and ventilated brake discs – paired with AP Racing four-piston calipers all round, a Torsen-type limited slip differential (LSD) and an adjustable traction control system. The new Evora GT430 Sport makes full use of carbon fibre to help hit its low kerb weight. This means that standard components include full carbon front and rear bumpers, front access panel, roof panel, rear quarter panels as well as a one-piece louvered tailgate with integrated spoiler. Once inside, the use of visible-weave, carbon composite components continues. 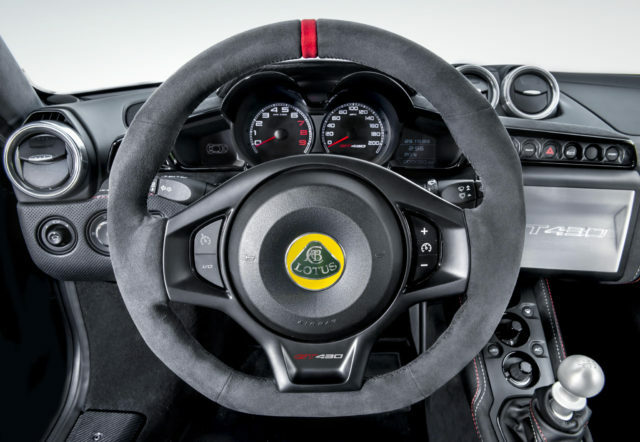 These include Lotus’ beautifully detailed carbon race seats, new carbon door sills and a new lightweight carbon instrument binnacle cover with a new design of graphic on the instrument panel. 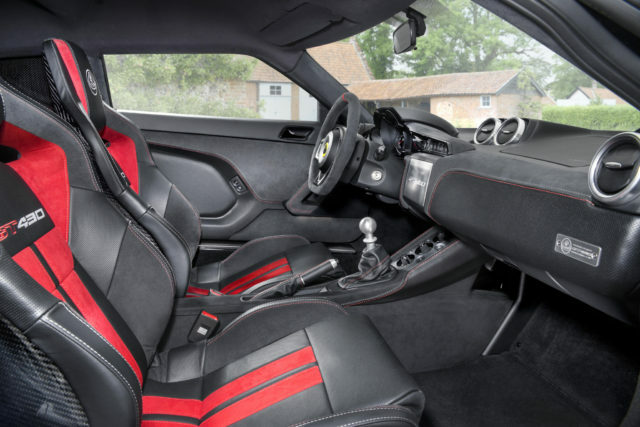 The steering wheel, dashboard, door panels, transmission tunnel and centre console are all trimmed in a combination of black Alcantara® and perforated leather, complemented by contrast twin colour stitching, in red and white, and matt black interior panels. The variable traction control function, standard on all models, is linked directly to the ECU and allows the amount of wheel slip to be set by the driver whilst in ‘Race / Off’. The Evora GT430 has 10 mm wider Michelin Pilot Sport Cup 2 tyres with 245/35 R19 at the front and 295/30 R20 at the rear, on one inch wider 10.5J rear wheels – these are optional fit for the Evora GT430 Sport. Every new Lotus Evora GT430 Sport can be personalised through the increasingly popular Lotus Exclusive programme. 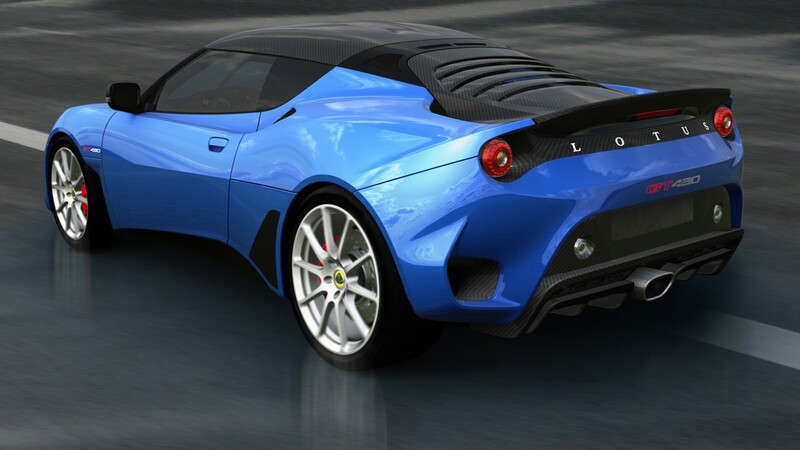 Developed by the Lotus Design team to inspire customers, it combines traditional British craftsmanship with the best of modern design, and allows owners to tailor vehicles to their personal taste. 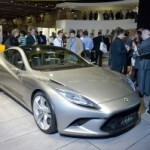 Since its introduction last year, roughly a third of all new Lotus cars now undergo some form of customisation. 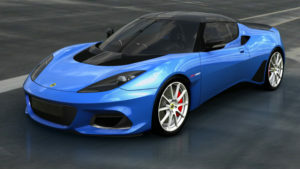 The new, fully homologated Lotus Evora GT430 range is available in two-seater configuration only and can be ordered now. 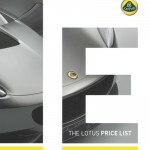 This entry was posted in Group Lotus and tagged Announcement, Evora, Evora GT430, GT430, Lotus, Sport. Bookmark the permalink.